"Smells, looks, and tastes delicious. As with many soup recipes, use this as the basis for an aromatic, tasty soup. I've made it with fresh minced ginger, fresh minced turmeric, and fresh ground cardamom. I didn't notice a substantial difference in flavor, but if you like fresh, give them a try." Soak lentils in a bowl with water to cover for 15 minutes. Heat olive oil and bouillon in a stockpot over medium heat. Add onions; cook and stir until translucent, about 5 minutes. Stir garlic, coriander, cumin, turmeric, and curry powder into onion mixture. Cook and stir until onion is tender and browned, adding a few spoonfuls of vegetable broth if needed to prevent burning, about 10 minutes more. Drain lentils and stir into onion mixture with remaining broth; bring soup to a boil. Cover stockpot, reduce heat, and simmer until lentils are soft, 30 to 45 minutes. Trim chard leaves, stack together, and cut into 3/4-inch strips. Stir chard into soup and cook until softened, about 10 minutes more. Substitute vegetable broth with chicken broth, if desired. Super delicious dish. Wife says make it again! Very fragrant and flavorful! Simple and easy to follow recipe. 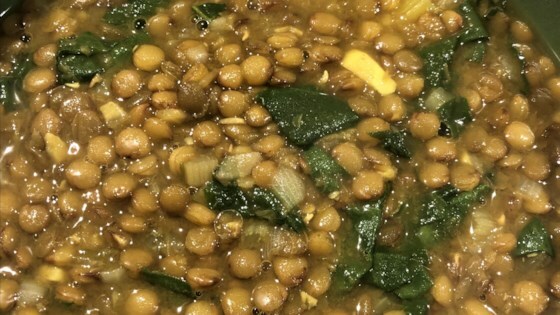 This soup is delicious, nutritious, and easy to make. I am always on the lookout for recipes using Swiss Chard since I have a lot in the garden. This was great! I will make it again!